Discussion in 'Music Games' started by Wicksy, Mar 5, 2015. This is Eric Pope from Harmonix. 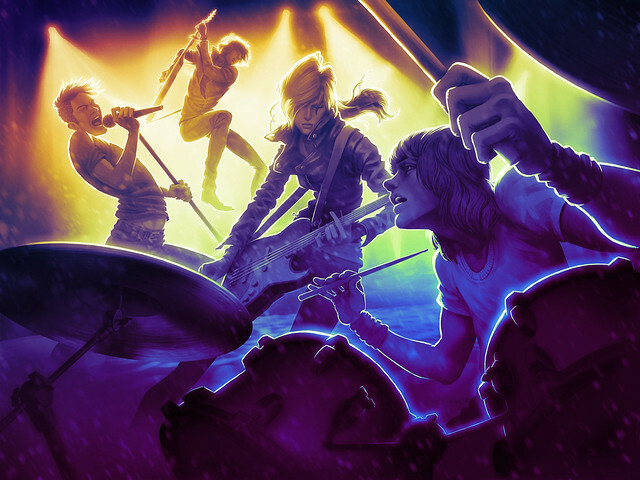 All of us at the studio are beyond thrilled to announce today that Rock Band will make its triumphant return to living rooms this year with Rock Band 4 for PlayStation 4! I’ve spent years as a community manager playing our various installments of Rock Band around the world with fans at every event you can imagine. I’m as excited as you are to have the next evolution of the franchise, Rock Band 4, on the current generation of console hardware. Since we released Rock Band 3 in 2010, Harmonix has branched out, developing projects in a number of new areas including motion control, PC and even VR. With every new project, the studio has challenged the perception of what a “music game” can be, and learned a lot in the process. With those lessons under our belt, we felt like we were prepared to dive back into our beloved Rock Band series, and actually push the genre forward. We’ve landed on a design that doubles down on the core Rock Band experience fans love, while innovating on gameplay in some super exciting ways that we’ll have more to say about a little later this year. The Rock Band 4 team is comprised of an immensely talented group of veteran game developers. I’m honored and humbled to work with these folks every day. This video piece will give you a chance to meet some of the passionate people behind the game and understand why we think the time is right for Rock Band’s return. Make no mistake, Rock Band 4 isn’t a simple “next-gen remaster” of an existing game- it’s the next step forward for the series. I can’t wait to rock out with you later this year!